Last weekend was the bordspel (boardgame) event in Hoogvliet. Last editions, we had lots of rain, but this time it was really beautiful. A very nice day at a perfectly organised event. The geocoin for the event has been designed and produced by us and most of the coins changed hands at the event. There are some of these beautiful geocoins left, which are now available in our shop. This geocoin has been developed around the theme of Elfenland (like the boardgame). On the frontside, you find the king of the elfs and the dragon and on the backside the unicorn from the game. This is the continuation of the popular "All in One" series. Released in 2006, 2007, 2008, 2009, 2010. 2011 and now 2012. The motto of the 2012 version is: "You'll never Cache alone". Available in 6 different versions (2 limited editions). This is your license to Geocache! Made of solid metal and plated in 24k gold, the Geocaching License is the size of a credit card and will fit easily in your wallet or pocketbook. We can also custom engrave your name. 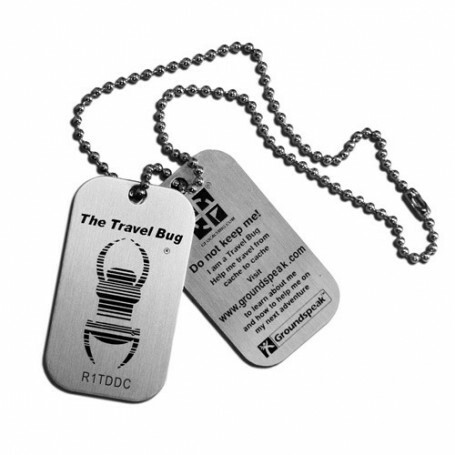 The backside has several different decoders to help you with deciphering some geocaches. In april 2000 the first geocache was placed by Dave Ulmer. In the Netherlands, the first cache (Amsterdam Urban 1) was places by team Onwaarschijnlijk (January 21st. 2001) and first found by Bert on February 10th. 2001. After that, it's grew enormously. Cachers from that time thought that they could do all caches of the Netherlands. But there came (and went) a lot more. To celibrate the 10-th anniversary, a Geocoin has been design by Delta123. The front of the coin shows all the Dutch provincies. In the middle the famous colors and a map of the Netherlands with the first Dutch cache (in the middle). On June 9, 2012 the 9th WWFM will happen all around the globe - and this very special WWFM IX trackable tag was created to commemorate this world wide geocaching event. Trackable at geocaching.com wth its own icon. Available by end of the week. Our portfolio Nano's has been extended with a geen and a rust edition. They are available per piece or in a set of 4. We are delivering nano's always with 2 waterproof logrolls. For more information about our presence at events, you can take a look at our website at the event calender.